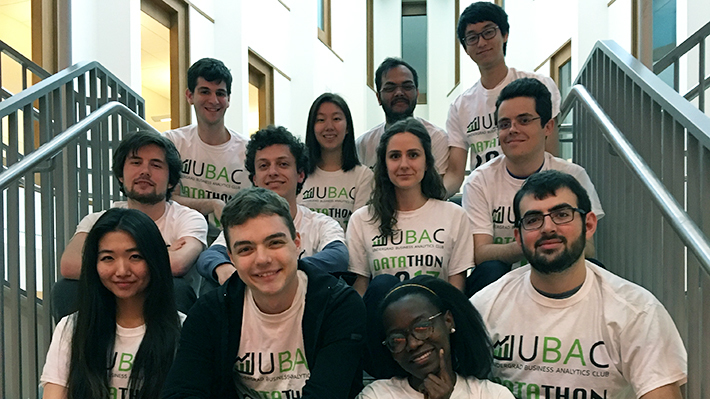 Students in LeBow’s undergraduate Business Analytics program participated in an inaugural datathon, a seven-hour marathon using data and technical expertise to develop insight and solutions for a business challenge. Hosted by the Undergraduate Business Analytics Club, the one-day event tasked student teams with analyzing and forecasting customer flow – an undertaking that can help businesses optimize supply chain and logistics management. Using more than 10 million customer transaction records from real retailers and service providers, teams analyzed flow patterns and applied statistics, data mining, predictive modeling and programming skills to develop solutions. Teams were evaluated on the accuracy of their prediction scores and the presentation of their modeling concepts by a panel of LeBow alumni, graduate students and industry judges including current student Abhipsa Behera MS ‘18, Anders Bergren BS ‘14 of Turnkey Sports and Entertainment, Tom Nolan MS ‘14 of Independence Blue Cross, Shachi Parikh MS ‘16 of David’s Bridal and Yu Xia, PhD, of Schweitzer Engineering Laboratories. In preparation for the challenge, Chuanren Liu, PhD, Assistant Professor of Decision Sciences and Management Information Systems, facilitated student workshops to review analytics processes, concepts and direction for working on a live business problem. Liu also provided guidance and oversight during the event. The winning team was comprised of five students: Nicolas Brooks ‘17, Xinyuan Chen ‘20, Alexandru Cristian ‘20, Mark Gramajo ‘18 and Amara Uche-Anya ‘18.